The word "lotus" was not used in this news article fifty-four months ago now from the official newspaper of the Archdiocese of Chicago, Catholic New World, nor does the word "lotus" appear in any official description on the website on which this grotesque image was found. 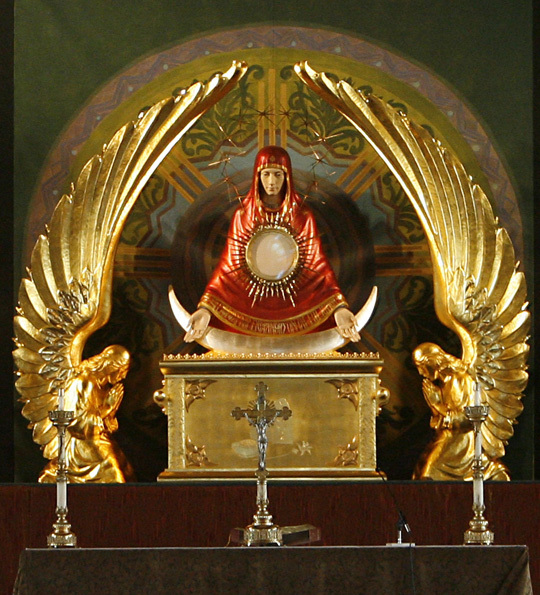 There is no doubt, however, that the monstrous "monstrance" pictured above does indeed blaspheme the Mother of God by showing her in the "lotus" prayer position of Buddhism and Hinduism. This hideous "monstrance" was installed by Francis "Cardinal" George, the conciliar "archbishop" of Chicago on May 31, 2008, a date each year on which the Feast of the Visitation is simulated in the Protestant and Masonic Novus Ordo liturgical calendar, at Saint Stanislaus Kostka Church in Chicago, Illinois. The representation of Our Lady is blasphemous, attempting to make her appear as a syncretist "bridge" between Catholicism and Eastern "mysticism" or "spiritualities," each of which is from the devil himself. That a conciliar "cardinal" considers such an outrage to be an acceptable representation of the Mother of God and a fitting dwelling place for what he believes, albeit falsely, is the Real Presence of her Divine Son in the Most Blessed Eucharist speaks volumes about the utter loss of the Catholic Faith in the highest reaches of the counterfeit church of conciliarism. In this regard, you see, the incorporation of "Eastern spiritualities" into the "mainstream" of many conciliar parishes and many of the older, more established religious communities that have been seized by the conciliar revolutionaries is but another expression of the belief of Protestant Pentecostalism, "baptized" in 1967 as the "Catholic Charismatic Renewal," that one has a means to be infallibly "directed" by God, whatever you want to call him, of course, without the mediation of the Catholic Church and without regard for her defined teaching and/or for what has been taught by her true Fathers and Doctors concerning the nature of the interior life which has nothing to do whatsoever with the diabolical pantheism of "Eastern spiritualities." Pope Leo XIII's warning about this danger to Catholics in the Untied States of America was was true at the time. It was, though, also a prophetic warning about how Catholic acceptance of the "direct pipeline to God" mentality would open the path clear to outright syncretism, which, of course, is commonplace in the conciliar structures to such an extent that even priests/presbyters in various Motu communities are powerless to preach against it, resulting in the surrender of not a few traditionally-minded Catholics into the conciliar structures who practice "yoga" at various times during the day in order to "breathe properly" and "relax" and "meditate" while listening to New Age trance music that comes straight from from the devil himself. The evil practice of the Hindu practice of "yoga," which as noted above, has been practiced in many conciliar religious communities of both men and women for decades now and has become a cottage industry for people seeking to find means of "meditation" in a world robbed of Sanctifying Graces by the sacramentally barren rites of conciliarism, involves the "emptying" of oneself in what is said to be "meditation." This process of "emptying" is produced by exhaling and other efforts to attain the "relaxation" of the body, arriving, it is alleged, in a state of "nirvana," of peace and tranquility. Oh, everything, starting with the fact that a Catholic is meant to be filled with Sanctifying Grace and to be conscious of the necessity of making an effort to become more and more like Our Blessed Lord and Saviour Jesus Christ with every beat of his heart, consecrated as he should be to the Divine Master's Most Sacred Heart through the Sorrowful and Immaculate Heart of His Most Blessed Mother, Mary our Immaculate Queen. To empty oneself of thoughts is to extend an open invitation to the devil to enter into one's soul and to take possession of it over the course of time. Catholic self-denial is not the same thing as Eastern self-abnegation. Eastern "mysticism" is indeed diabolical. It is pantheistic, founded in the belief that God and His creation are one, that we can become Him if we empty ourselves of distractions and "meditate" upon His unity with all of creation. This is what leads many Catholics in the conciliar structures to believe that God is present in a blade of grass just as He is present in every particle of a validly consecrated Host. Yes, it is true that Our Lord is not present in most hosts that are attempted to consecrated in the Protestant and Masonic Novus Ordo service. What is being referred to here, however, is the belief of Catholic syncretists that a truly consecrated Host contains no more of God than does a blade of grass or than does a cow. Eastern "mysticism" is thus yet another form of self-redemption, of semi-Pelagianism, if you will. Some physical exercises automatically produce a feeling of quiet and relaxation, pleasing sensations, perhaps even phenomena of light and of warmth, which resemble spiritual well-being. To take such feelings for the authentic consolations of the Holy Spirit would be a totally erroneous way of conceiving the spiritual life. Giving them a symbolic significance typical of the mystical experience, when the moral condition of the person concerned does not correspond to such an experience, would represent a kind of mental schizophrenia which could also lead to psychic disturbance and, at times, to moral deviations. What has been the effect of this 1989 instruction? Has there been any discouragement of the practice of Eastern "prayer methods" used so widely in conciliar religious communities? Indeed, there was, at least as late as eight years ago, a "Zen meditation" room at Inisfada (the Gaelic word for Long Island), the retreat house of the Society of Jesus, now in conciliar captivity, in Searington, Long Island, New York. A former associate and benefactor of ours, who remains in our prayers every day without fail, who visited that retreat house in February of 2000 placed a Miraculous Medal in that room. And what exactly has happened to Monsignor Luciano Gomes Paulo Guerra, the Rector of the Shrine of Our Lady of Fatima in Portugal who permitted Hindu "priests" to offer their demonic "worship" to their false "goddess" on May 5, 2004, in the Chapel of the Apparitions that is built on the very ground on which Our Lady herself appeared to Jacinta and Francisco Marto and Lucia dos Santos? Nothing. Nothing. He was to allowed to retire in "good standing" despite having during the Shrine of Our Lady of Fatima into a center of ecumenism (see A New Fatima For A New Religion). A Catholic priest here is busy popularizing yoga, saying it is beyond religion and "truly universal". Father John Ferreira's latest book, "Health, Wealth and Happiness Through Yoga", was Thursday released by the Archbishop of Agra Diocese, Albert D'Souza, at St Peter's College. "The book is a primer, aimed at popularising the intricate knowledge of the esoteric science of yoga, which is beyond religion and truly universal," Fr Ferreira told IANS. "Modern society with its cup full of stresses, and a package of mental and physical ailments, stands in dire need for India's yogic knowledge," he said. Archbishop D'Souza agreed. "Yoga integrated into the school curriculum will provide a holistic approach to education as a science that not only prepares a student for life but provides the art of living well," he said. "Joyful living, drawn from the depths of one's own rhythm of life, according to the goal set by the Creator, is the foundation of health, wealth and happiness," he added. In a message read out at the event, Oswald Cardinal Gracias, the Archbishop of Mumbai and president of the Catholic Bishops Conference of India, said: "Through the prescribed postures and exercises one improves one's all round sense of well being and is able to enter into oneself so as to commune better with god." Ferreira, the author, feels yoga has no religion. He himself has been a follower of many yoga gurus and has extensive research to produce the book. The book includes views of Christian priests who have approved his yoga experiments. So much for Ratzinger/Benedict's Notification concerning the writings of Father Anthony De Mello, S.J. and his Some Aspects of Christian Meditation. Well, contradiction and paradox are of the essence of a "church" that denies the very nature of dogmatic truth as it lords thumbs its nose at the condemnation of what is called today "hermeneutic of continuity." The chief exorcist of the Diocese of Rome, Father Gabriele Amorth, who said several years ago that the conciliar rite of exorcism is worthless to expel the devil and his minions, does not hold such a sanguine view of "Eastern spiritualities" as do the apostates at Vatican Radio or those at L'Ossevatore Romano who specialize who praising such hideous cultural infestations as "The Beatles" and "Harry Potter." Here is what Father Amorth said last year on the subject of "yoga:"
Care to disagree with Father Amorth? Well, go ahead. I will also append an article written by the late Father John Anthony Hardon, S.J., on this very subject. Conciliarism does not speak thus of barbarians and their false religions, many of whose evil practices have been incorporated into the context of the Protestant and Masonic Novus Ordo service in the name of of the slogan of the "inculturation of the Gospel." Conciliarism speaks of "elements of truth" that are possessed by false religions, leaving several billion people around the world to fend for themselves throughout their lives without knowing the wonders of the true God as He has revealed Himself exclusively through the Catholic Church, without knowing how to order themselves and their societies by submitting themselves in a spirit of humility and docility to the Deposit of Faith that God has entrusted to that Catholic Church, and without having belief in, access to or cooperation with Sanctifying Grace. "All people go to Heaven" is a commonly-held belief now amongst ordinary Catholics, including many, although not all, conciliar "bishops" and the lion's share of conciliar "priests." Fifty years of such blasphemies and sacrileges and outrages and abominations, starting with the the liturgical abomination par excellence, the Protestant and Masonic Novus Ordo worship service itself, which is now forty-three years old, have desensitized most Catholics as to what exactly constitute the honor and glory and majesty God. Indeed, a steady diet of such blasphemies and sacrileges and outrages and abominations have robbed most Catholics of any genuine knowledge as to Who God is and that he is not a Judeo-Masonic-naturalistic-pantheistic projection of the human mind Who accepts with equanimity and joy every novelty and invocation contrary to His Deposit of Faith because it makes people in false religions "feel good" and "tolerated" by Catholics as their "equals" before Him. This is the time in salvation history in which God has chosen for us to live. The graces He won for us by the shedding of every single drop of His Most Precious Blood on the wood of the Holy Cross and that flow into our hearts and souls through the loving hands of Our Lady, the Mediatrix of All Graces, are sufficient for us to carry the crosses of this present moment. This is the worst time of apostasy and betrayal in the history of the Catholic Church. Some of the outrages and abominations taking places under the auspices of the counterfeit church of conciliarism would have shocked the sensibilities of some of the worst heretics of the past, including the Arians. This is, however, the time that God has chosen for us to live, which means that there is work for us to do as the consecrated slaves of His Most Blessed Mother's Sorrowful and Immaculate Heart. We must remember that each one of our sins, no matter how seemingly trivial to us, has wounded Our Lord once in time and wounded His Mystical Body, the Church Militant on earth. This means that we have reparation to do for our sins and those of the whole world. While we must be concerned about the apostasies that have come forth from the counterfeit church of conciliarism as we resolve most firmly with the help of God's graces never to have anything to do with its false sect ever again, we must, of course, concentrate on getting home to Heaven as members of the true Church. Although believing Catholics know that they must strive for Heaven with every beat of their hearts, consecrated as those hearts must be to the Most Sacred Heart of Jesus through the Sorrowful and Immaculate Heart of Mary, it is good to be reminded that this is the goal upon which we must focus our efforts. God will take care of His Holy Church in His good time. While we must make sure to cleave to true bishops and true priests in the Catholic catacombs who make no concessions to conciliarism or to the nonexistent legitimacy of its false shepherds, we must also understand that the extent to which our work here on earth will help souls, including our own, depends upon the extent to which we seek to grow in virtue as we pursue sanctity, seeking to immerse ourselves in First and Last Things at all times so as to avoid the plagues of worldliness and naturalism into which Catholics across the vast expanse of the ecclesiastical divide succumb to most readily. 1) Assisting at the daily offering of the Holy Sacrifice of the Mass offered by true bishops and true priests who make no concessions to conciliarism or to its false shepherds. Realizing that this may not be possible for people who live in areas where the true Mass is not offered by these bishops and priests, it is especially incumbent upon those who do live reasonably nearby chapels administered by the modern-day Saint Athanasiuses to make whatever sacrifices they need to make to get to daily Mass without fail. Not possible for working fathers to do every day? All right. Mothers and their children can organize their schedules to go every day. This is not impossible. This is a matter of the will. Do we want to spend all eternity in Heaven? Really? Then isn't it a good idea to be present at the pathway to Heaven, the very unbloody re-presentation of the very Sacrifice of the Son to the Father in Spirit on Truth that was effected on the wood of the Holy Cross. And those who are encumbered only by attachments to a particular place and familiar surroundings (and not obligations of work or family) must detach themselves from the dust of this earth and move to where they can worship God every day at Mass and to have their immortal souls nourished by the worthy reception of His very Body, Blood, Soul and Divinity in the Most Blessed Sacrament in Holy Communion. 2) Eucharistic piety. We must spend time in prayer with Our Beloved in His Real Presence. No one prays "alone" before the Blessed Sacrament. Our Lady, Saint Joseph and all of the angels and saints are with those who may have no other living human being on earth with them as they kneel in front of a tabernacle where Our Blessed Lord and Saviour Jesus Christ is truly present in His Body, Blood, Soul and Divinity. 3) The daily Rosary. Each of us should make the effort to pray as many Rosaries each day as our states-in-life permit. The Rosary is the weapon given by Our Lady to Saint Dominic de Guzman to fight heresy. Shouldn't we consider it our privilege now to pray it well--and many times--each day, imitating the love exhibited by little Francisco Marto, who prayed Rosary after Rosary to console the good God? And one of those Rosaries must be the family Rosary prayed on our knees. 4) True Devotion to Mary. Total Consecration to Our Blessed Lord and Saviour Jesus Christ through His Blessed Mother's Sorrowful and Immaculate Heart is path to liberate us from attachment even to whatever merit we earn from our prayers and indulgenced works and sufferings and sacrifices and penances and mortifications and humiliations. 5) The Brown Scapular of Our Lady of Mount Carmel. We must wear our Brown Scapulars (after making sure that we have been enrolled properly in this mantle of Our Lady) and fulfill the conditions associated with being clothed in the garment of the Mother of God herself. 6) Home Enthronement to the Most Sacred Heart of Jesus and the Immaculate Heart of Mary. Entrusting our homes to these Twin Hearts of matchless love helps us to be loving and patient and meek and humble with the very people with whom we live and with whom we want to share the glories of Heaven for all eternity, helping to replicate the Social Reign of Christ the King in our own homes. 8) Weekly Confession. We bathe our bodies frequently. We must bathe our souls in the live-giving streams of the Most Precious Blood of the Divine Redeemer, Our Blessed Lord and Saviour Jesus Christ, as they are poured out over us in the Sacred Tribunal of Penance. 9) Distributing blessed Miraculous Medals and Green Scapulars to those whom God's Holy Providence places in our paths each day. We never meet anyone by "accident" or "coincidence." You might be the only person who can help a wayward soul get home to Heaven. We must never be afraid of "offending" anyone by giving them sacramentals that Our Lady herself wants distributed to help bring people to her Divine Son through the true Church that He created upon the rock of Peter, the Pope. The Miraculous Medal was given by the Jewish convert Theodore Ratisbonne to his Catholic-hating brother, Alphonse, to whom Our Lady herself appeared in the Church of San Andrea delle Fratte on January 20, 1842, in Rome, Italy. Don't think that these sacramentals are not meant to be given to non-Catholics or to fallen away Catholics. 11) Accepting the Will of God each day and in each circumstance with joy and love and gratitude. We must remember that there is nothing that can happen to us in this life that is the equal of what one of our least Venial Sins caused Our Lord to suffer in His Sacred Humanity during His Passion and Death and that caused His Most Blessed Mother's Sorrowful and Immaculate Heart to be thrust through and through with Seven Swords of Sorrow. We must thank God for each cross we have been given. Each cross has been fashioned for us from all eternity by His very hands. Who are we to complain? The cross is the path of our sanctification and our salvation. We must have total Faith in God, the Faith of Abraham and the Faith of Our Lady herself when she gave her perfect fiat to His Holy Will. Total Faith, total confidence in God as He has revealed Himself to us exclusively through His true Church. There is never any cause to question God. He is Who is. He answers each of our prayers, although they may be with a resounding "NO!" at times for His greater honor and glory and for our own sanctification. We do not need to know "why" this or that happens in our lives. All we need to know is that all things happen in God's Holy Providence and that while He does not will evil to be done, He permits it to be done so that good may be drawn out of it, so that we might see in some injustice done to us or calumny spoken about us the injustices and calumnies we have committed by means of our sins against His greater honor and glory and majesty, how we we have scandalized others and given such bad example time and time again. We must love God as He has revealed Himself through His true Church with our whole heart, mind, soul and strength, never deceiving ourselves that there is some naturalistic way to "resolve" social problems. We must be champions of Christ the King and Mary our Immaculate Queen, not agents of naturalistic politicians or seek to subordinate the truths of the Faith to appease the enemies of God responsible for the blasphemies of conciliarism. There are many alive today, including traditionally-minded Catholics, who breathe in the spirits of Baal by various forms of "meditation" that come from Eastern "religions" and are thus making their souls playgrounds of the devil and enemies of the defined dogmas and practices of the Catholic Faith. We must pray for their conversion out of this diabolical trap once and for al. May it be our privilege as the consecrated slaves of Our Blessed Lord and Saviour Jesus Christ through the Sorrowful and Immaculate Heart of Mary to plant at least a few seeds for the vanquishing of the spirits of Baal, including those that are propagated by his counterfeit church of conciliarism, as the fruit of the Triumph of that same Immaculate Heart and thus the restoration of the Social Reign of Christ the King and her, Our Immaculate Queen.